Pioneers in the industry, we offer crisp making plant from India. We manufacture these crisp making machines at cost-effective prices with best quality stainless steel to serve small scale enterprises and young entrepreneurs. 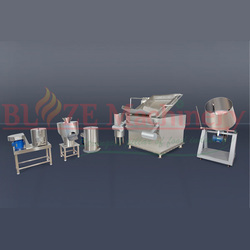 At Blaze Machinery, we make all machineries which are used to manufacture potato chips. These machines are made from high-grade stainless steel for the highest performance. These machines are corrosion resistant which contributes to their durability. Easy to clean and use, these machines are an end-to-end solution to make finest crisp i.e, Karela Crisp, Potato Crisp, Apple Crisp.